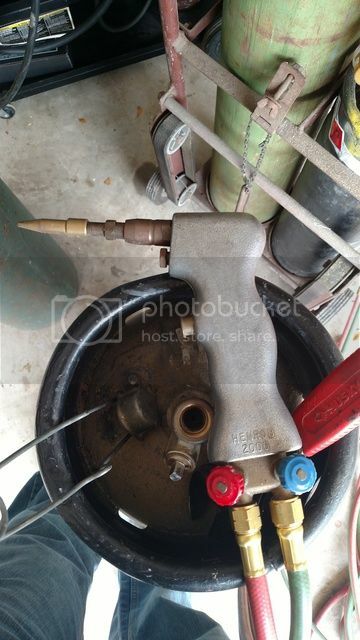 Anybody ever use one of these weird little oxyacetylene torches? Mine says Henrob 2000 on it, apparently it's the same as a dhc 2000 and I think today they are marketed as a cobra torch 2000. I had never seen one until I basically got this one for free today. Looks like they run about $400-500 new, which suprised me when i looked it up. It was included with some large oxygen and acetylene bottles I bought from a guy today. It was his Dad's, and he didn't know anything about it unfortunately. YouTube videos make it look like a handy little tool, just wondering if any of you had any real world experience with it. I'd have to buy some relatively expensive tips for it to make it do anything useful for the type of work I do, just trying to figure out if it'd be worth it. If not I may just sell it and recoup the price of the bottles. Interesting a tool I know nothing about. Typing this I'm only 6' away from my oxyacetylene rig. The reverse learning curve is what I read most about that and the gun weight and your hand getting too hot on long cuts. I think it is a pretty useful tool in the metal art world but for everyday shop use I would opt for a tool that was meant for that specific need. IE cutting torch, Tig, and the likes. Already have a plasma cutter. It claims 5/8th's it does a good job on 1/4"
I do not work with aluminum or SS much so I prefer my O/A over a plasma it is much more versatile. One of these days I will come across a sweet deal on a plasma and probably pick it up till then I have what I need. I fired it up and messed with it for a little bit. Seems to work fine, but I just threw it in a drawer in the garage, probably never use it, but who knows. I'd try to just sell it, but it seems like no one knows much about them, so I can't imagine there being much of a market for it. I'm sure I'll find a use some day. Like I said, it was just thrown in with the bottles I was buying, so I'm not out anything. plasma cutter is not a clean cut on aluminum. I'd rather use a skill or jig saw on aluminum. A plasma cutter is great on SS and steal. I'm still not going to give up my O/A set up. Used it yesterday to bend some round rod with ease. Oxyacetylene handles everything I need. Don't think I could justify buying a plasma unless I happened to fall into a great deal on one. Said the same thing about a MIG vs my stick welder not too long ago though, and now I wouldn't trade my Miller 211 for the world. Sure makes life easier. Did it come with any of the attachments JLCBBQ? It looks like it is pretty useless as is. No, that's the issue. All I have is the torch and small head that's on it. I assume the head I have is for welding thin material, produces a small flame. Might be able to sweat copper with it, but I have my bernzomatic for that. I found all the attachments for $150 starting bid on eBay. If you buy the attachments individually from the manufacturer they are $40-50 a piece. Kind of expensive for something I never knew I needed! The guy I got it from was cleaning out the garage, I sent him a picture of all the attachments in the kit they originally came in and asked him to let me know if he finds them. Unless he comes through and finds them, I doubt I will ever mess with it again. The good news is, I scored a full "K" oxygen tank, a full #4 flat top acetylene, both had working Victor regulators, 25' of hose in good condition, a stout little homemade bottle cart, and that little torch for $240. Oxygen bottle even has a good test date! Plan is to sell the smaller bottles I already had and at least break even. Yeah that is the tip that the video does all the welding with. It is a pretty cool set up I hope you get some more parts for it. Ending up auctioning the torch on eBay, got $130 for it after shipping. Decided I was never going to invest in the missing accessories, or ever mess with it so might as well pass it on to someone else. Only gave $240 for the bottles, cart, Victor regulators, hose and that torch, so I'll call it another great Craigslist score.